Wafcol Adult Dry Dog Food for Small and Medium Breeds (Salmon & Potato) helps the wellbeing of a normally active dog, providing all the necessary nutrients to keep dogs fit, healthy and happy throughout their lives. We've been using Wafcol Salmon and Potato Dog food for about 4 years now. Our Black Labrador has a very sensitive digestive sustem and we searched for a long time to get a product that suited her. 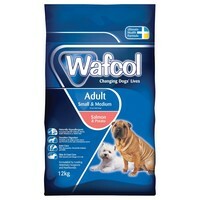 We spent a lot of money on vet visits and different types of dog food until we found Wafcol and use it every day. I'm impressed with the quality of the food and the fact that our dog's tummy is settled. She also has a beautiful shiny coat and sparkling eyes and I believe this is from the salmon in the dog food.